Agilent Technologies has introduced an economically priced 2-channel external output amplifier that provides up to 50 Vpp (Volts peak-to-peak) amplification of function/arbitrary waveforms. 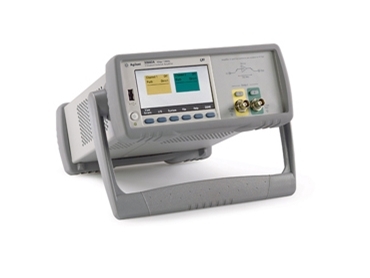 The instrument is designed to work in conjunction with engineers' existing function generators to extend the voltage range and offer low-distortion outputs. The new Agilent 33502A 2-channel 50 Vpp Isolated Amplifier is ideal for R&D development and test engineers who need signal sources greater than 20 Vpp without sacrificing accuracy. It also has a programmable pass-through mode for use in high-voltage applications including aerospace defense, automotive and industrial. "Engineers in R&D and manufacturing need a convenient way to create accurate and reliable signal sources at higher voltages using their current function generators," said Gary Whitman, vice president and general manager of Agilent's System Products Division. "The Agilent 33502A external output amplifier extends their voltage range over 20 Vpp, which is important to engineers for testing and qualifying their designs and devices." The 33502A external output amplifiers have a two-unit, half-rack mechanical form factor, which fits well as a bench-top unit or in a test system, and is configured with LAN (LXI Class-C compliant) and USB interfaces. It also provides both a programmable interface and a soft-key-driven front panel, making it easy to configure. The Agilent 33502A external output amplifiers have a fully isolated front end offering a superior 5x voltage amplification. It can be independently configured with input coupling (AC|DC) and input impedance (50 ohm|1M ohm) to match specific circuits. The input path can also be switched from amplified to direct (unamplified) without removing or reconnecting cables.